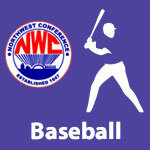 May 2015 – NWC-Sports.com | The Official Site of the Northwest Conference for nwc news, nwc scores and more. Crestview was ranked 3rd in Division IV in the final OHSFSCA Softball State Poll. Crestview 10 New Bremen 0, 5 inn. Lincolnview 5 Marion Local 4, 12 inn. In voting by Northwest Conference baseball coaches for the 2015 baseball season. senior Nate Owens, a catcher from Crestview was named Player of the Year. Owens was a unanimous selection receiving 160 out of a possible 160 points in the balloting. Paulding junior Damon Egnor finished second in the balloting with Spencerville freshman Jaret Montenery finishing third. Crestview coach Jim Wharton tallied 19 points to be named Coach of the Year at the all-conference selection meeting Monday evening in Delphos. Wharton led Crestview to an 8-0 record and their 21st Northwest Conference baseball championship. Spencerville’s coach Troy Montenery finished second in the coach of the year balloting. Owens was a 4-year starter for the Knights and batted .522 in league play this past season. His overall season average was .435 and included 9 extra base hits (one home run) with 23 RBI’s. 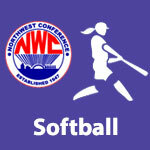 In voting by Northwest Conference softball coaches for the 2015 softball season. senior Hope Schroeder, a pitcher from Columbus Grove was named Player of the Year after being runner-up for that honor during the 2014 season. Schroeder received first-place votes from 7 of the conference coaches. Coaches may not vote for players from their own schools. Bluffton senior Maddie Willis finished second in the balloting with Allen East sophomore Ariana Schmiedebusch finishing third. Allen East coach Bill Mattevi tallied 19 points to be named Coach of the Year at the all-conference selection meeting Monday evening in Delphos. Mattevi led the Mustangs to a 7-1 record and a Northwest Conference co-championship. Carl Etzler of the co-champion Crestview Knights finished second in the balloting. Hope Schroeder batted .506 with 8 home runs and 46 RBI’s in leading the Bulldogs to a 21-6 overall recored. Schroeder also posted a 16-5 record as a pitcher with a 3.00 ERA. Coldwater 16 Crestview 4, 6 inn. 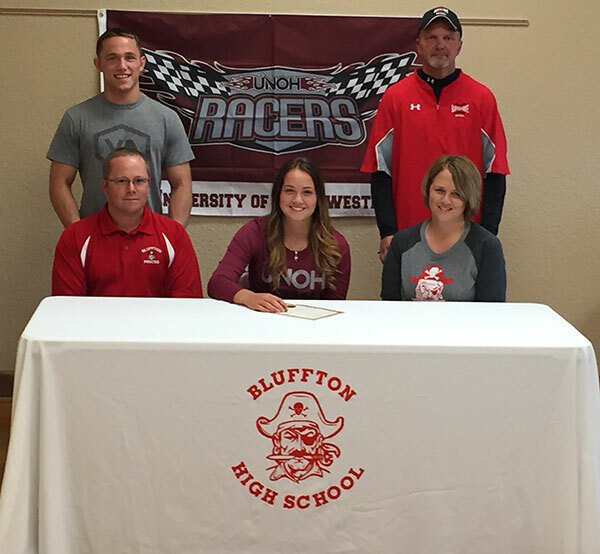 Bluffton’s Mackayla Wilson signed a letter of intent to play softball at the University of Northwestern Ohio. Bluffton senior Mackayla Wilson signed a letter of intent to play softball at the University of Northwestern Ohio. Mackayla has been a letter winner the past 4 seasons as Bluffton’s catcher. Mackayla is Bluffton’s single season home run record holder. She was also second team All Northwest Conference and the team’s most valuable player in 2014. Seen in the picture seated from left to right is Mackayla’s father Mike Wilson, Mackayla Wilson, and Mackayla’s mother Jill Wilson. And standing from left to right is Mackayla’s brother Zach Wilson and Bluffton’s Varsity Softball Coach Tony Rumer. Columbus Grove swept both the boys and girls track championships in the Northwest Conference tournament held Thursday/Saturday at Columbus Grove High School. This makes two years in a row that the Bulldogs have taken both the boys and the girls crowns. Grove has now won 4 consecutive boys NWC track championships. ​Bluffton finished runner-up in both the boys and girls and Spencerville took third place in the team standings for both. 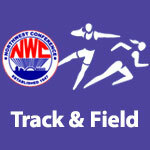 Bayley Tow of Lincolnview and Kacie Mulholland​ of Spencerville were voted as the 2015 NWC Male and Female Athletes of the Year respectively by the coaches of the league schools.